Biotherm holds a White D-Tox party on Feb 29 from 7-9pm at Robinsons Raffles City Biotherm counter. Receive $10 voucher (instantly redeemable) and 4-pc Hydration Door Gift when you arrive. 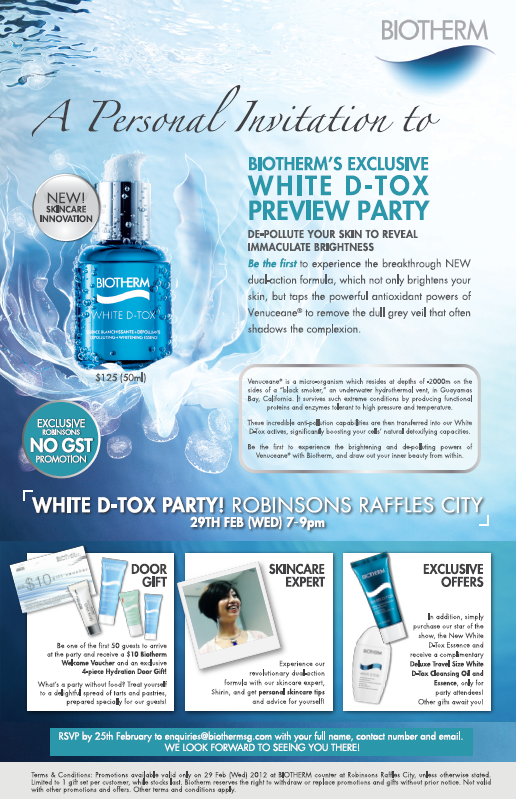 Plus get a deluxe sample White D-Tox Cleansing Oil and Essence with any purchase of the new White D-Tox Essence. RSVP via 62330245. Dior offers a mini mascara with any purchase of their revolutionary New Look Mascara. Available at islandwide Dior counter. Valid through Feb 29. 100% Pure offers free shipping and free 15ml Coffee Bean Caffeine Eye Cream, 15ml Brightening Scrub+Mask, and 15ml Red Wine Resveratrol Nourishing Cream with any $60 purchase. No code needed. Valid through Feb 16. Ahava offers 20% off all Body products and a free tote valued $20 and three packette samples with any purchase. Enter code MYVALENTINE at checkout. Valid through Feb 18. Beauty.com offers a free deluxe sample of Darphin Stimulskin Plus Rejuvenating Lifting Serum worth $40 value with any $30 skincare purchase. No code needed. Click on the banner at home page to get the offer in your shopping cart. Beauty.com offers a free full-size Stila Custom Color Self-Adjusting Blush in Pink with any $10 purchase. While supplies last. Bliss offers a free Totally Skin Love Kit with any $75 purchase. Enter code LOVELY at checkout. Valid through Feb 29. Bliss offers a free Sisley Discovery Kit mini with any Sisley purchase of $250 or more. Enter code DISCOVERY at checkout. Valid through Feb 29. Bliss offers a free normal brush head plus hydro cleanser with any Clarisonic System purchase. Enter code CBRUSH at checkout. Valid through Feb 29. Bliss offers a free cinch bag with any Birkenstock purchase. Use code BIRKGIFT at checkout. Valid through Feb 29. Borghese offers a free five piece Fango gift set with any $50 purchase. No code needed. Dermstore $12 Blow Out Sale comes again. Get your beauty fix for up to 80% off from now through Feb 19. E.L.F offers $1.98 Shipping with $14 purchase. Enter code LOVE198 at checkout. Valid through Feb 19. E.L.Foffers an additional 50% off on any $20 minerals purchase. Use code ECD11 at checkout. Valid for 48 hours. Elizabeth Arden offers free shipping and a free 5-pc gift set worth $75 with any $40 purchase. Set includes deluxe samples of Ceramide Plump Perfect Ultra Lift and Firm Eye Cream SPF 15, Ceramide Plump Perfect Ultra Lift and Firm Moisture Cream SPF 30, Ceramide Gold Ultra Face and Eye Capsules, Ceramide Purifying Cream Cleanser, and a cosmetic bag. Enter code 40CERAMIDE at checkout. Valid through Feb 27. Fresh offers a travel-size Soy Face Cleanser with any $100 order. Enter code INFUSION at checkout. Offer valid through Feb 18. Jack Black offers a free 90ml Supreme Cream Triple Cushion Shave Lather worth $12.50 or a free 90ml Beard Lube Conditioning Shave worth $10.50 with any $70 purchase. Enter code SUPREMECREAM2012 or BEARDLUBE2012 at checkout. Valid through Feb 23. Perfume.com offers 10% off any order. Enter code DOGHOUSE at checkout. Valid through Mar 31. Prescriptives offers a free Magic Powder deluxe sample and free shipping with any purchase. Valid through Feb 16. Sephora offers a mini Clinique Moisture Surge Intense with any $25 purchase. Enter code INTENSE at checkout. While supplies last. Shu Uemura offers free shipping and four free deluxe samples with any $65 purchase. Samples include 9ml Red:Juvenus Vitalizing Retexturizing Emulsion, 9ml Red:Juvenus Vitalizing Retexturizing Cream, 12.5ml Red:Juvenus Vitalizing Renewing Night Cream, and 10ml Red:Juvenus Intense Vitalizing Concentrate. Enter code REDCARE at checkout. Valid through Feb 19. Skin1 offers 12% off with any purchase plus GWPs from Eminence and Babor. Enter code Spring12 at checkout. The Body Shop offers $10 off with any $40 purchase. Enter code PRESIDENT at checkout. Valid through Feb 20. Too Faced runs Manic Monday Offer on Feb 20. Receive free shipping with any purchase. Use code 2SULTRY at checkout. Valid for Feb 20 only.